Transitions between two input clips using an animated lens flare. The clips dissolve into each other, while a lens flare moves along a straight line. 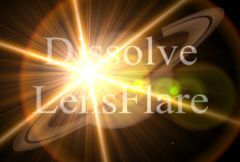 The lens flare grows and shrinks over the duration of the effect. The Dissolve Amount parameter should be animated to control the transition speed. Hotspot Center: X & Y, Default: screen lower left. Gamma: Default: 1, Range: 0 or greater.